The morning of recording my first impressions live of Echo of the Wilds I had not heard of the game. I saw a tweet stating it was currently available for half price, took a look and was instantly impressed with the screenshots. A few seconds into the trailer I stopped it and my decision was made. 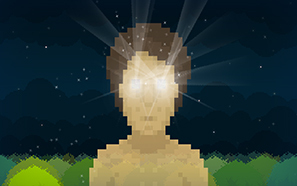 Echo of the Wilds sports gorgeous 2d pixel art throughout. Plains of flowers by the coast, rivers, forest and caves all look wonderful with subtle animations of trees swaying gently in the wind and frogs and rabbits enjoying the scenery. There lies something beneath this aesthetic though; something I only saw hints of in my first hour, something much darker than the surface suggests. 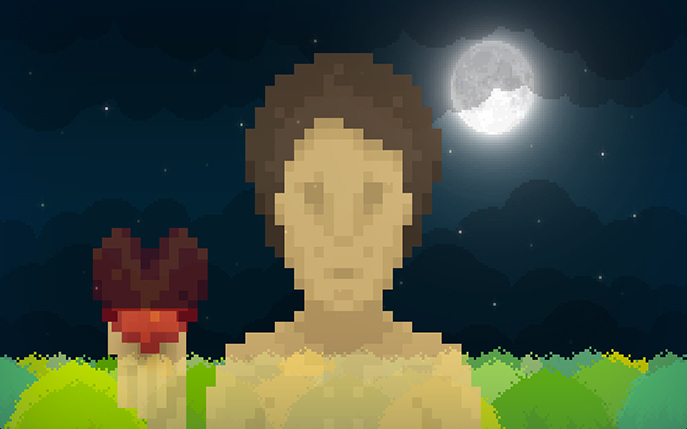 The tutorial is clear and teaches you the very basics of the game: eating, collecting, building an axe, chopping down a tree and offering to a shrine. There are a few more things it mentioned but I didn't pick them up at first. The writing style the game presents itself with takes some getting used to, but I'll talk about that later. After completing the tutorial, feeling somewhat (misplaced) confidence in my potential ability for survival within this world I was stumped by the UI. Upon first loading the game it requests you press 'A'. This 'A' is in white on a green circled background, the same that appears on an Xbox 360 controller. There wasn't any controller support. Easy to work out but the menu itself I found initially baffling. It is in the same style as some other menus plus the inventory in-game. I selected the tutorial a second (and third) time before delving into the main game modes. This confusion is also because the descriptions of each mode (and everything in the game) are written in a very 'British' manor (I'm from the UK and had a hard time with some of it). 'Slatherous bestowith fromith thy waterorious flowinglings a finnery gillyorinousity of gorpery tastirificousness'. Translated (my best guess): 'Flowing from it is a generous amount of tasty water'. Employing an exaggerated 'British' type of talking, Echo of the Wilds combines this style with also some fictitious words (see above), that at least sound like they are describing what you think they should be. Once you get used to the writing it becomes highly enjoyable; maybe with the exception of the pun 'berritasty' when you eat berries! I fear if English is not your first language you may have real trouble understanding what the game is saying to you. The writing doesn't hold all the charm the game offers. The transition animations are wonderful. My personal favourite was when your face occupied most of the screen and in your eyes you see your character walking from where you were to the other eye, your next destination. The sleeping animation is also great, yet haunting as you watch to see if you survive the cold night. There are three modes; tutorial, story and endless. After I got confused with the UI again and did a couple of very unsuccessful endless attempts I started the story. 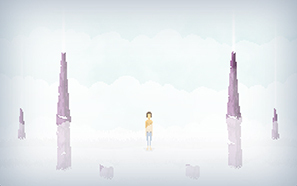 The beginning of the story mode continues and expands the tutorial but in the context of the game world.There is an area you always sleep in but upon leaving you need to scout one of eleven possible areas; the grid is 4x3. If your scouting a square is successful you are asked if you want to remember the area. 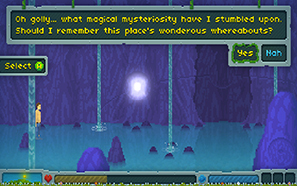 My best guess for this is if yes, you can revisit the area and it will be the same. If no, upon returning to that square it will be different, but I'm not completely sure. 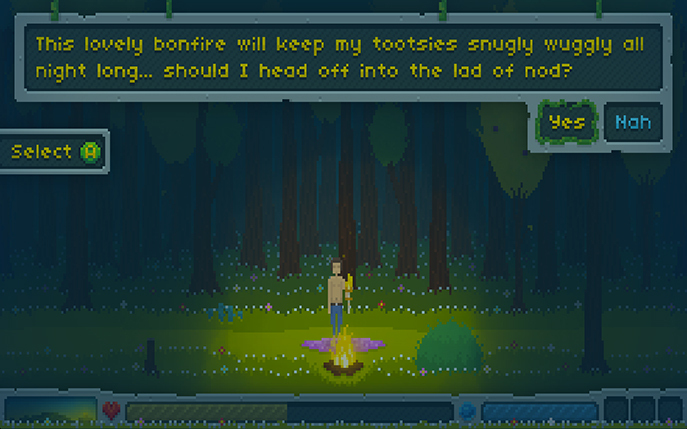 Your first objectives will be gathering wood and flammable materials to burn at night, this will keep you warm, and food to keep you from starving and offering to shrines. You have bars for health (drains with running, time, performing actions and bad weather but increased with food), and vitality (drains with time but recovered by drinking). The third bar shows the time of day. I saw hints in the hour that something menacing and much darker than the game's tranquil surface resides in the wilds. It will be very interesting to find out what this exactly is. I very much enjoyed my first hour with Echo of the Wilds and will be playing more. It has a welcome combination of gorgeous visuals, humerous writing, challenging difficulty and intriguing undertones. 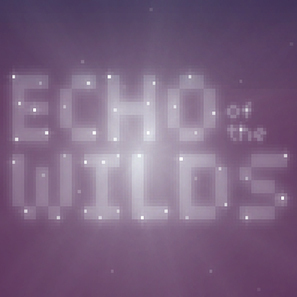 Echo of the Wilds: Part One: here. Echo of the Wilds: Part Two: here. Echo of the Wilds: Part Three: here. Echo of the Wilds: Part Four: here.